North Queensland Cowboys’ halfback Jake Clifford has starred for Queensland U20 in their 30-12 win over New South Wales U20 this evening. Currently playing for the Northern Pride in the Intrust Super Cup, Clifford scored two tries, set up another and controlled the game with his kicking game. 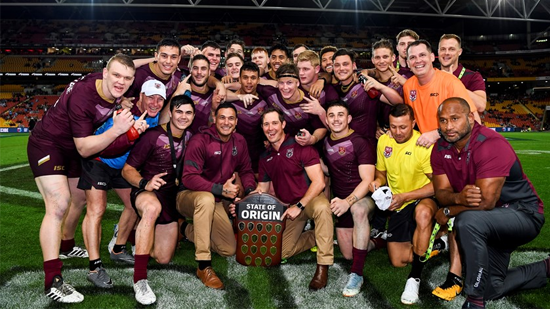 The win is the junior Maroons’ first since the Under-20 Origin was introduced in 2012. Clifford opened the scoring after slicing through the Blues defence with a nice show-and-go. Handling errors plagued Queensland early and New South Wales hit back through a fantastic diving effort to winger Brian Too. With scores locked at 6-all, Reed Mahoney, fresh on the field, set up Corey Horsburgh with a nice short ball to crash under the posts. After the break it was all Maroons as they shot out to a 24-point lead. Clifford bagged a double in almost identical fashion to his first, throwing a dummy and bursting through to score. Five minutes later he had a hand in Queensland’s fourth try, spreading it wide to fullback Corey Allan who sent a bustling Kurt Wiltshire over the try line. Clifford was involved once again in the Maroons’ last try with a bullet cutout pass to winger Tristan Sailor pushing their lead to 24. The Blues recorded a consolation try to winger Billy Smith in the dying minutes with the Maroons down to 12 men following a sin binning to prop Tom Flegler. Clifford was named Man of the Match for his efforts, as Queensland were finally able to lift the Darren Lockyer Shield after six long years. Queensland U20 30 (Jake Clifford 2, Corey Horsburgh, Tristan Sailor, Kurt Wiltshire tries; Jake Clifford 5 goals) def. New South Wales U20 12 (Billy Smith, Brian Too tries; Kyle Flanagan 2 goals) at Suncorp Stadium. Man of the Match: Jake Clifford (Queensland).